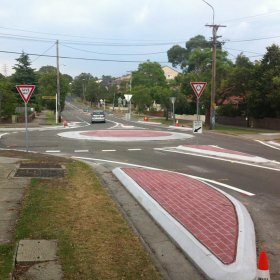 Lambert & Rehbein undertook the concept design, detailed design and contract administration for the construction of a roundabout at the intersection of Arthur Street and Pemberton Street, Homebush West. The works included realignment of the kerb and gutter, realignment of concrete footpath, pedestrian refuges, pedestrian crossings, median islands, signs and road marking, relocation of bus stop, consideration of landscaping, service alterations and carriageway resurfacing. Lambert & Rehbein worked closely with Council to develop solutions that addressed all the design constraints taking into account bus turning movements and existing driveways located close to the intersection. The project team also prepared the contract documents and construction specification for the project and called quotations from carefully selected contractors. Throughout the construction period, Lambert & Rehbein was the main liaison between Council and the preferred contractor.